Sandra Vranes and friend Tamu Smith are multimedia personalities and popular speakers at Time Out for Women. They are authors of Diary of Two Mad Black Mormons (2014). 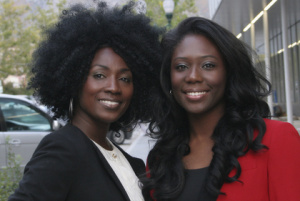 They met through the Genesis Group, became friends, and started a blog, Sistas in Zion, in 2009 as a way to keep in contact with each other when they no longer lived in the same state. They shied away from personal posts, and instead wrote about their shared religion as Sista Beehive and Sista Laurel. As members of The Church of Jesus Christ of Latter-day Saints, they initially wanted to “create a place where their friends and family of all faiths could openly converse and also share humorous aspects of Mormon culture.” But their audience has expanded far beyond friends and family. They also want to help recent converts who feel a little out of place in a new LDS culture, as they did. Vranes was born in Utah, but her family moved first to Trinidad and Tobago for several years and then to Georgia. They moved back to Utah when she was a teenager. After she married she moved from Utah and now lives in Idaho. This page was last edited on 14 September 2017, at 16:03.